FROM Bidadari Island, we can see the beautiful City of Jakarta in the evening clearly. It's not far from the capital, creating one of the islands in the Thousand Islands tourist area this often. Distance from Pulau Bidadari from Beach Marina Ancol, North Jakarta, approximately 14 kilometers. Distance using a speedboat about 20 minutes. Pulau Bidadari only initially empty land, forests, bushes, and no uninhabited gradually developed into the resort island, a mix between nature conservation, historical sites, recreational and sea. On 28 February 1975, the governor of DKI Jakarta, Ali Sadikin, appointed PT SEABREEZ Indonesia to develop the "Island of Pain Management" (Bidadari Island), Pulau Cipir (Khayangan Island) and Pulau Nirwana which at that time in the blank with the center of the activities Thousand Islands nautical tourism. However, in 1985, former Governor of DKI Jakarta R Soeprapto recalls Khayangan Island and Pulau Nirwana with the intent that Indonesia PT SEABREEZ can concentrate more to develop Pulau Bidadari. Pulau Bidadari have ownership certificates HGB 225 2003 covering 3.6 hectares (ha) in the name of PT Indonesia SEABREEZ or 60 percent of the total area of Pulau Bidadari. They also use right certificate No. 19 of 2.4 ha, or 40 percent of the total area of Pulau Bidadari in the name of the local government of DKI Jakarta as fasos and fasum in Pulau Bidadari. Geography Bidadari Island 106 is 44.8 degrees East Longitude (BT) and 6 latitude 02.2 degrees South (LS), among the group of island Onrust, Khayangan Island, Island kelor, and Pulau Ayer. The island area is including villages Untung Jawa, Kepulauan Seribu Selatan District and Thousand Islands District Administration. Pulau Bidadari have advantages compared with other islands, namely more than 60 percent of the island consists of plants rare trees such as bulging, the tree of peace (baringtonia exelsa), ebony tree (diospyros maritama), sentigi tree (pempis acidula), glodokan tree , some fruit trees, and mangrove forest that saved and well maintained. In fact, the whole beach is white sand with natural sea water is relatively clean and clear. There are also community biawak (veranus salvator) who live more freely with a population less than 100 head of protected and highly familiar with humans. Also living community elang bondol (halias Indus) which is a type of bird that is almost extinct and is protected. To strengthen the atmosphere of a natural nature, the whole building using the concept of coastal homes with a variety of wood and the main building to use the concept of traditional Manado, pier labuh use ironwood and the gazebo on the beach along the roof of bamboo and sago palm. There is also a history of the site Dutch heritage in the fortress in 1786 with a diameter of approximately 23 meters with a wall thickness 2.55 meters and 6 meters high building. This fortress made of red stone. In a few cannon, the remnants of ancient mortar and kept saved. The need for clean water can be obtained from the fresh water source Bidadari Island that there are not many in the other islands in the Thousand Islands. While the electric power generated from diesel power (genset). Bidadari Island has 49 cottages consist of three types, namely of 23 deluxe cottages, 20 family cottages, suites and six cottages. For the purpose of meeting / party, a two-room multi-purpose hall (MPH) with a capacity of 100 each and 40 people. This place also provides the facility outbond training, both at sea and ashore, in cooperation with training institutions. The most major, Bidadari Island provides the main menu is a seafood restaurant. The raw material obtained directly from fishermen in a fresh condition. Menu-menu favorites such as soup rajungan, green cooked shellfish butter, baby stingrey, and fish head soup. Barbeque party on the night of the event is the most impressive and honored visitors. Facilities for water recreation on the island of Bidadari provided the jet ski, banana boat, cannoe, boat excursions, fishing pier, and fishing chart. There is also a form of support facilities billiard hall, gift shop, basketball field, volleyball, musala, jogging track, and others. From the market, in the Thousand Islands region there are 12 resort islands joined to the association of the Thousand Islands Wisata Bahari (Perwita PUSRI), ie the Pantara, uninteresting, Putri, Bira, Sun, Grid, kul-kul, Eastern Box, Laki, Birds , Ayer, and Bidadari. With a population of visitors who average in the five years of 120,000 people per year. In the last five years, Pulau Bidadari visited an average of 35,000 people per year. 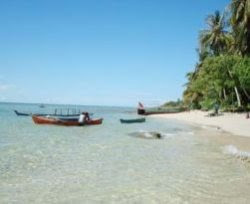 Thus, the Island Bidadari to take the market share of 29.1 percent of the population of visitors tour Thousand Islands. Bidadari Island visitors are mostly made up of a group of large companies that hold meetings and family gathering.